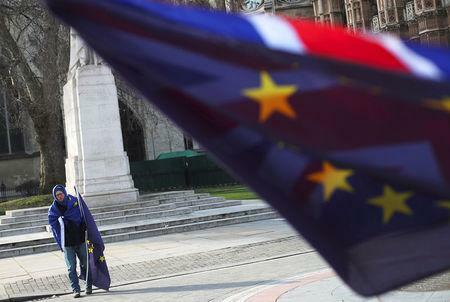 LONDON (Reuters) - The deal on Brexit transition gives British businesses 20 months of valuable time and marks the victory of pragmatism over politics, the head of British business lobby CBI said on Tuesday. Carolyn Fairbairn, director-general of the Confederation of British Industry, said she was broadly pleased with the transition deal agreed between Britain and the European Union on Monday. "Yesterday was a good day in the Brexit process. We know how firms have been consistently planning for a hard Brexit," Fairbairn told the Innovate Finance conference. "That is 20 months of time that is genuinely valuable. This is the first time we have seen pragmatism being put ahead of politics," Fairbairn said. But she added: "The risk of no deal has not completely gone away." She called on regulators to think about the transition deal as now being very likely, meaning they can give "air cover" or certainty for businesses. Financial firms want the Bank of England and the Financial Conduct Authority to say they can rely on the transition deal so they don't have to have all their Brexit plans in place by March next year. "In the longer term, we're going to move quite quickly into the final deal shape. This fundamental opportunity to have a model of regulatory alignment, particularly in services to safeguard access, is where we need to go next," Fairbairn said. "And I think what we want to see by October is the shape of that, because only that really gives the long term certainty that our services need," she added.